Nellie Cashman held on for the wire to pay a hefty $41.60 to win the Grade 3 Virginia Oaks at Colonial Downs on Saturday evening under Forest Boyce. After facing off with Three Heart for much of the race, Boyce and Nellie Cashman managed to hold off a deep-closing Praia who just missed the win. 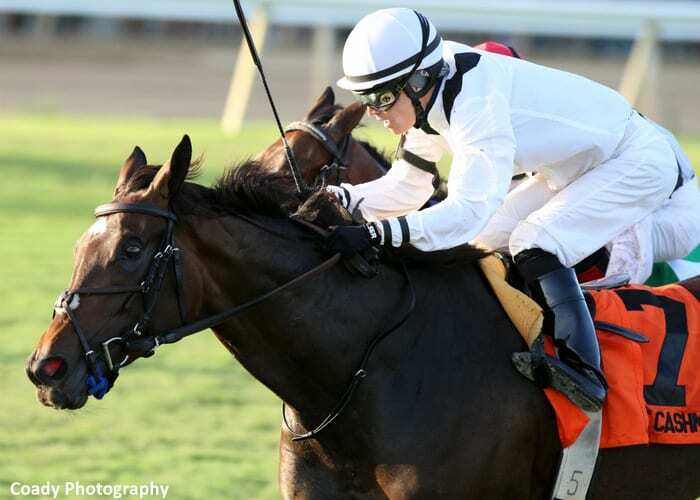 The victory was just the second in the 3-year-old filly's career after she broke her maiden in June for trainer Francis Abbott, III and owner Sycamore Racing LLC. Nellie Cashman was bred in Pennsylvania by Nelson Clemmens and is the daughter of Mineshaft and Pine Bluff mare Alison's Winner. Praia was second, followed by Three Hearts. The final time for the 1 1/8 miles on good turf was 1:52.86. More information to come. This entry was posted in Racing and tagged Colonial Downs, francis abbott, Horse Racing, horse racing and breeding, Nellie Cashman, Paulick Report, Sycamore Racing, thoroughbred, Virginia Oaks by Paulick Report Staff. Bookmark the permalink.